Bring a touch of fall to your home by decorating your living room mantel with these fun DIY ideas. We’ve rounded up eight beautiful and easy mantels to give your home an upgrade this Thanksgiving season. This quick and rewarding holiday craft will bring a touch of glamour to your home. All you need is scissors, a pen, sparkly paper, twine and tape to make this fun banner possible. Get the tutorial here. Decorate your mantel with a mix of candles, lanterns, window frames and seasonal wreathes to give your home a fall aura. This layered, non-centered display allows you to be as creative as you wish. Get the tutorial here. We love this sharp and sophisticated fall mantel. The white painted pumpkins and a creative banner with window frames gives this fireplace a neutral, soft look. Get the tutorial here. This simple, elegant fall mantel is as beautiful as it is easy to make. Just gather some birch, leaves, pumpkins and squash to give your home a similar look. Get the tutorial here. After admitting to many failed attempts, this blogger finally nailed the fall mantel — and we are loving it. To create this look, all you need is an empty frame, leaves, Mason jars and a festive garland. Get the tutorial. This fall mantel is a fun, crafty idea for anyone hosting Thanksgiving dinner this year. The festive turkey design on the re-purposed wood is the perfect artwork to put above your fireplace during the Thanksgiving season. Get the tutorial here. The thankful banner sets the tone for this creative Thanksgiving mantel. We love the gratitude frame this blogger created using a frame, mini-clothespins, twine and fake leaves. It’s a perfect project for a family and will get everyone in the holiday spirit. Get the tutorial here. Warm up on Thanksgiving with this homey and inviting fall mantel. The pumpkins with bronze glitter and rustic orange candles dress keep a fireplace's formal look while making it an inviting place to be. Get the tutorial here. 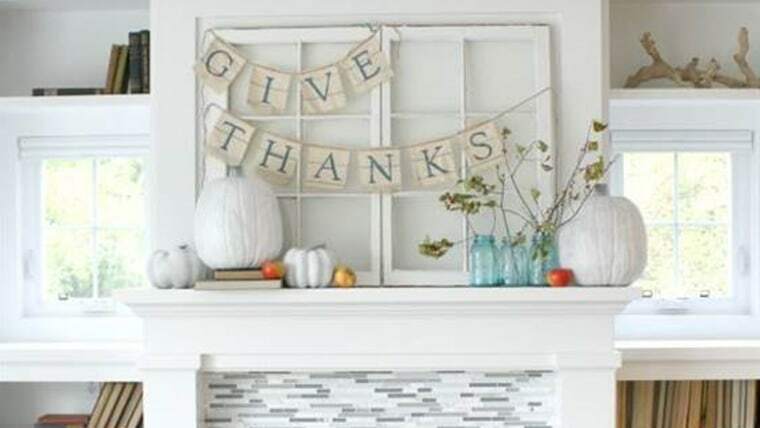 For more Thanksgiving home inspiration, check out these charming DIY holiday banners.